Hey friends! I hope y'all have loved getting to see a glimpse into our wedding day so far through our Southern Weddings feature and yesterday's post about our getting ready photos! Today I want to share our favorite first look photos with y'all! As always, a huge thanks to miss Perry Vaile for capturing these stunning photos and our emotion from the day, and for Casey and Kristin for creating this heartfelt heirloom wedding film for us! A lot of brides and grooms debate about having a first look on their wedding day. I know my sweet mom was a little bit shocked and confused about why we wanted to have a first look, and many of y'all might be in the same boat. So, we thought we would share a bit more about our choice with you! Zack and I both agreed that we wanted to see each other before our ceremony because we knew it would calm our nerves throughout the rest of our day. We really wanted to have a few sweet moments to ourselves, since the rest of our day would be spent surrounded by loved ones. Those few minutes are some of the moments I remember most clearly from our wedding day. Spending that time alone helped reaffirm why we were there that day - to join together as just the two of us with God, as husband and wife, to create a unique and love-filled family of our own! In addition to making the choice to have a first look from an emotional standpoint, we also knew that it was a smart choice based on our logistics and wedding timeline. We were got married at 5PM, and had our cocktail hour and reception all at the same venue. Making sure our guests were comfortable and well-loved throughout our entire wedding day was of utmost importance to us, so having to take all of our group, family, and newlywed photos after our ceremony would have meant too much time spent away from our friends and family who traveled in to celebrate with us! We recognize that those of y'all who will have your ceremony and reception at two separate locations, with time built into your timeline for travel for your guests, likely have more time to include group and family photos after your ceremony. However, that simply wasn't the case for us! We wanted a quick cocktail hour (only 30 minutes) where the two of us would take newlywed photos and then immediately join our loved ones for dinner, so that we could spend as much time with everyone as possible! It was so windy on our wedding day, y'all!! My veil kept swooping in different directions, and my bouquet ribbon kept flying in my face! 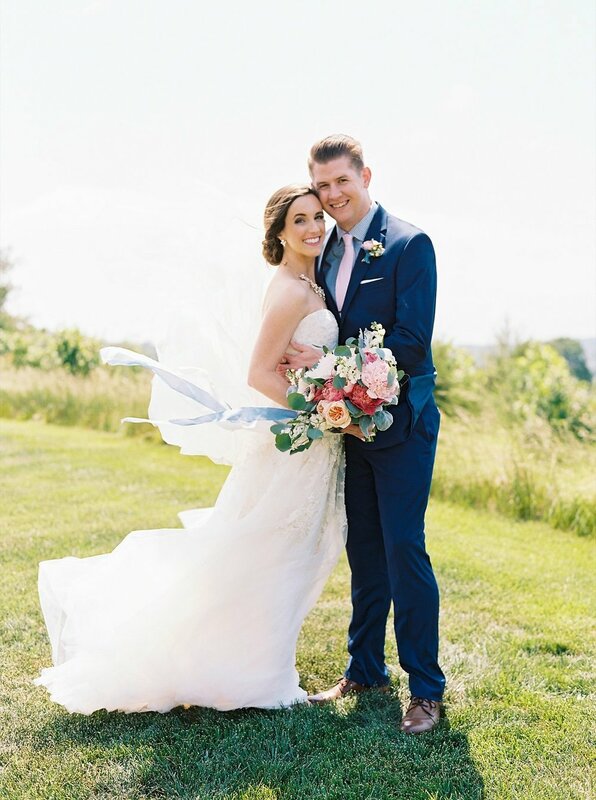 I'm so happy Perry captured this more realistic moment from our first look - make sure to keep scrolling to the bottom of the post for a couple more wind swept photos! Perry also encouraged us to think about our timeline from a light standpoint. Sunset would begin to happen shortly after our ceremony, and it was really important to me that we were able to capture all of our portraits in natural light! So, by having our first look prior to our ceremony, we were able to take our first look photos, bridal party photos, and family photos all with beautiful sunlight, and then took some more golden hour photos of just the two of us after our ceremony! It was the perfect balance, and provided us with the light and airy photos we knew we wanted! And just for some giggles, here are a couple of photos that show how truly windy it was on our wedding day! We were so happy that it didn't rain that day, that we didn't even think about crazy wind being a factor!! But as you can see, the wind also worked its magic in our photos by providing such gorgeous movement to my veil and bouquet ribbon, so I was okay with it :) If my hair could talk, it might have told you otherwise though, haha! Thank goodness for hairspray and an amazing HMU team is all I can say! Also, how perfect is this video Casey and Kristin captured of our first look? They showed it to us as our wedding film teaser before showing us our full wedding film (which you can watch here! ), and we could not stop playing it on repeat! They are so talented, y'all!